Bigelow Aerospace President Robert Bigelow talks during a press conference shortly after he and NASA Deputy Administrator Lori Garver toured the Bigelow Aerospace facilities on Friday, Feb. 4, 2011, in Las Vegas. NASA Deputy Administrator Lori Garver is given a tour of the Bigelow Aerospace facilities by the company’s President Robert Bigelow back in Feb. 2011, in Las Vegas. 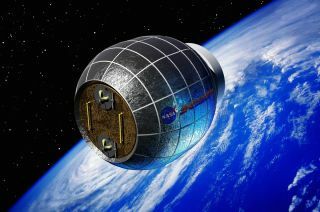 NASA has been discussing potential partnership opportunities with Bigelow for its inflatable habitat technologies as part of NASA's goal to develop innovative technologies to ensure that the U.S. remains competitive in future space endeavors. “The BA 330 and expandable habitats will not just offer enhanced protection from radiation and micrometeorites, but protect future astronauts from a much more dangerous threat …lack of funding," Gold concluded.